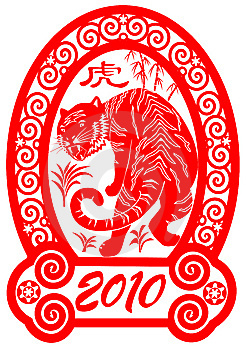 And now for something completely different…..February 14, 2010 ushers in the Chinese Lunar Year of 4707, Year of the Metal Tiger. Prepare yourselves. Tiger energy can leave you sitting in the dust at the starting gate, wondering where everyone went, if you’re not ready. During last year’s Earth Ox, everyone was expected to work hard, keep nose to the grindstone, plow a nice straight furrow (no fancy stuff please,) and be satisfied with slow progress towards long range goals. Some of us (including this tiger,) are feeling a little despondent and worn out by this relentlessly conventional approach to life. But Tigers are masters of patience. They know how to wait, in utter stillness, like no one else. Then when they’re ready to move, watch out. They are capable of going into action with dazzling panache, power, and speed. So expect a display of stunning forward movement during the first month of this new year (February), which is the Tiger month in the Tiger Year. Now, let’s look at some finer aspects of the energetics. For one thing, this is a Metal year. Tigers are naturally Wood element creatures, so for those of you familiar with Chinese Five Element theory, you will note that we have a Metal/Wood conflict here. The metal actually attacks the wood; think of chopping down a tree, or pruning back a bush. What this might mean in the grand scale of things is, unfortunately, an escalation of conflict in the world, especially given the association of metal with weapons. On the other hand, Tiger energy is famously erratic and unpredictable (exactly opposite from the Ox.) So prolonged conflicts are less likely than sudden skirmishes and unexpected bursts of violence. How this year plays out for you, is dependent on your own nature and astrology. All of us have four animals in our astrological make-up–one each for the year, month, day, and hour of birth. So it’s not always a good idea to rely solely on your year pillar, which provides only the broadest possible brushstroke of your character. That said, let’s take a quick look at how each of the animals might fare in this Metal Tiger year. RAT—Rats and Tigers have a mutual admiration society. You’re feeling pretty confident right about now, due to your uncanny ability to make use of Ox’s strength and endurance for your own advancement. (Except for other Oxen, you’re probably the only one among us who isn’t exhausted.) You’ll have another good year, but be prepared for unpredictability. Unlike last year’s clear straight path, you must be able to go with the flow and endure some surprising twists and turns on your way to the cheese. OX—O.K., you’re done. Go back to the barn and eat. You’ve always disliked the Tiger’s charisma anyway, and attempting to stay in the lead now will only make you irritable. Best strategy is to stay home and nurture your family. TIGER-–You’ve been waiting and waiting. Good job at enduring this Ox year and minding your manners. Now you get to step up to the plate and reveal your grand scheme. Hopefully, you’ve spent the last month refining the details and keeping everything under your hat. When you emerge everyone will applaud and see you for the natural leader you are. Don’t disappoint them. The only thing you can do wrong this year is not trust your instincts. Enjoy the natural rhythm of your own qi–charge ahead when you’re full of energy, go into your den and rest when you feel like it. Everything will get done in perfect order just by being yourself. RABBIT—It’s been a while since anybody has listened to you and appreciated your exquisite sensitivity and intuition. Though there are no serious admonitions for you this year, it’s still best to lie low, tend to your home, and stay out of the Tiger’s way. You dislike conflict, and the Tiger’s muscular force may feel abrasive to you. Hang in there until 2011 when the Rabbit Year hosts your special brand of magic. DRAGON-–Dragons didn’t have a particularly good year last year. Like Tigers, they hate being yoked to a plow. It’s likely that you will feel an uplifting sense of relief, and dare I say freedom, as the Tiger Year begins. But be careful, or perhaps I should say “mature.” Dragons are charismatic leaders, love to be in the limelight, and are considered to be the mythological rulers of Heaven. But Tigers are their equals and reign over the Earth. Don’t make the mistake of thinking all the applause and attention is for you. With a proper Taoist approach, and spiritual maturity, Tigers and Dragons can accomplish an alchemical relationship. The wise Dragon will avoid competing with the Tiger this year. You won’t win, and you’ll miss out on the potential for magic. A word to the wise is sufficient. HORSE-–Finally! You are being given your head. Your athletic spirit and physical prowess are just what the Tiger needs on its team. You possess a noble heart and will enthusiastically devote yourself to the Tiger’s agenda. The whole thing will feel like marvelous fun, especially in contrast to the dullness of last year when you were forced to pull that heavy load with a thick skinned insensitive Ox. We know, just because you’re a large muscular animal, does NOT mean you’re suited for plowing. Everybody makes that mistake, except your friend the Tiger. SHEEP-–Hopefully you took my advice last year and kept your head down, quietly developing some creative work while successfully quelling your need to “manage” the Ox. You’re not quite out of the woods yet. Tigers can’t be managed either, and they hate to be team members. You are dealing with the ultimate loner here. Give it up, you’re not strong enough to take on the Tiger. You’ll do just fine if you continue to develop your artistic pursuits, smile politely at the Tiger’s grand schemes, go along with things, and try to be supportive. You must not, under any circumstances, attempt to take over the reins! You could get hurt. Don’t worry. When the Rabbit year comes in 2011, you will get to have a talent show and collect awards and trophies. MONKEY-–You and Tiger are opposite energies, and therefore famous for annoying one another. This is not your year. Though I know it’s practically impossible for you to do, try to take a back seat and stop tinkering with things. Your well-known skill for coming up with miraculous solutions to problems of your own design, just to keep yourself from getting bored, will have no effect this year except to make you look inconsequential. But since you can’t keep yourself from doing this anyway, best strategy is to find a local venue for it where you can scheme privately. How about working up something truly dazzling for the Dragon Year? ROOSTER-–You’ve made considerable progress towards your long term goals during the Ox Year. And since you are unique in your ability to keep your eyes on the prize, you would really like to keep up the good work. However, this Tiger year could trip you up a bit. Roosters and Tigers are both ambitious. But Roosters are more precise in their focus and capable of delaying gratification to get what they want. Tigers want it all and can be impulsive. This interferes with your plans. Be prepared for digressions from your path and don’t be hard on yourself about it. This will be good practice for the upcoming Rabbit Year in 2011 when all the frivolous socializing will try your patience. DOG-–All you loyal and hardworking Dogs are probably dragging with exhaustion from the Ox Year. Take heart. After a few months rest (please take a nap in your nice cozy bed in front of the fireplace,) you’ll feel completely refreshed by midsummer and ready to team up with Tiger and Horse in a powerful trio that embodies the qualities of integrity, courage, and loyalty. You will be rewarded handsomely for all your endeavors this year. And rewards, after all, are what matter to the Dog. PIG—Pigs, being congenial, kind, generous, and sociable, have no problem letting Tigers run things as long as they have ample opportunity for fine dining and parties. Since Pigs are in charge of keeping the rest of us civilized, and have a broad appetite for life, they can manage quite well in almost any circumstance, given their ability to digest any situation and turn it into wisdom. There is also a harmony relationship between Pigs and Tigers, so the coast in clear. You can even begin to enjoy the finer things in life again (think good wine, truffles, and quail eggs.) Thank goodness that dreary Ox, who had no appreciation for these things, has gone back to the barn. MAY THE YEAR BRING YOU PEACE AND GOOD FORTUNE! This entry was posted in The Year of the Animal. Bookmark the permalink.